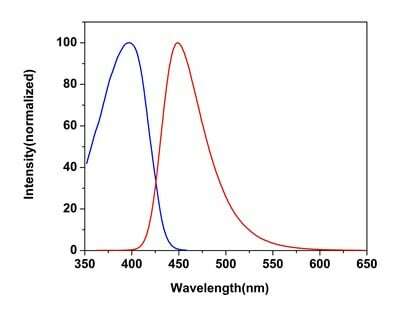 Cell Viability Assay Kit (Fluorometric - Blue Ex 405 nm) (ab176748) uses a proprietary cell viability dye whose fluorescence is strongly enhanced upon entering into live cells. The dye is a hydrophobic compound that easily permeates intact live cells. The weakly fluorescent CytoCalcein Violet 450, AM is hydrolyzed by intracellular esterase to generate a strongly fluorescent hydrophilic product that is well-retained in the cell cytoplasm. The esterase activity is proportional to the number of viable cells, and thus directly related to the fluorescence intensity of the product generated from the esterase-catalyzed hydrolysis of the fluorogenic substrate. Cells grown in black wall/clear bottom plates can be stained and quantified in less than two hours. The assay is more robust than tetrazolium salt or Alamar Blue® based ones. It can be readily adapted for many different types of fluorescence platforms such as microplate assays, fluorescence microscope, and flow cytometry. Review the cell health assay guide to learn about more kits to perform a cell viability assay, cytotoxicity assay and cell proliferation assay. 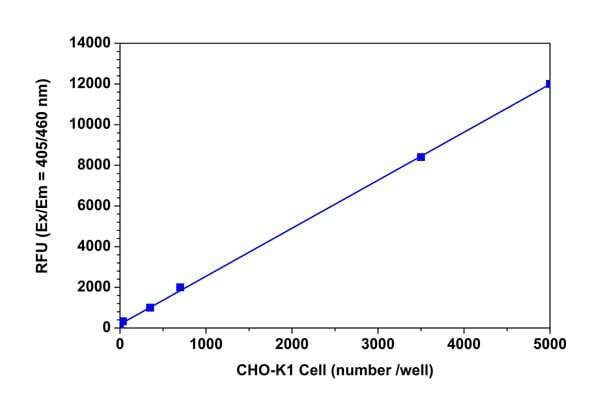 CHO-K1 cell number response was measured with Cell Viability Assay Kit (Fluorometric - Blue Ex 405 nm) (ab176748). CHO-K1 cells were seeded overnight at 0 - 5,000 cells/well/100 µL in a black wall/clear bottom 96-well plate. The cells were incubated with 100 µL/well of CytoCalcein Violet 450 dye-loading solution for 1 hour at room temperature. The fluorescence intensity was measured at Ex/Em = 405/460 nm. The fluorescence intensity was linear (R2 = 1) to the cell number as indicated. The detection limit was 70 cells/well (n=6). ab176748 has not yet been referenced specifically in any publications. Publishing research using ab176748? Please let us know so that we can cite the reference in this datasheet. There are currently no Customer reviews or Questions for ab176748.